To the uninitiated, a modern-day mikvah looks like a miniature swimming pool. In a religion rich with detail, beauty and ornamentation—against the backdrop of the ancient Temple or even contemporary synagogues—the mikvah is surprisingly nondescript, a humble structure. Its ordinary appearance, however, belies its primary place in Jewish life and law. The mikvah offers the individual, the community and the nation of Israel the remarkable gift of purity and holiness. No other religious establishment, structure or rite can affect the Jew in this The mikvah offers the individual, the community and the nation of Israel the remarkable gift of purity and holiness way and, indeed, on such an essential level. Its extraordinary power, however, is contingent on its construction in accordance with the numerous and complex specifications as outlined in halachah, Jewish law. The world’s natural bodies of water—its oceans, rivers, wells and spring-fed lakes—are mikvahs in their most primal form. They contain waters of Divine source, and thus, tradition teaches, the power to purify. Created even before the earth took shape, these bodies of water offer a quintessential route to consecration. But they pose difficulties as well. They are not necessarily kosher for immersion (a competent rabbi must be consulted). In addition, these waters may be inaccessible or dangerous, not to mention the problems of inclement weather and lack of privacy. Jewish life therefore necessitates the construction of mikvahs (“pools”), and indeed this has been done by Jews in every age and circumstance. Briefly: A mikvah must be built into the ground or built as an essential part of a building. Portable receptacles, such as bathtubs, whirlpools or Jacuzzis, can therefore never function as mikvahs. The mikvah must contain a minimum of 200 gallons of rainwater that was gathered and siphoned into the mikvah pool in accordance with a highly specific set of regulations. In extreme cases where the acquisition of rainwater is impossible, ice or snow originating from a natural source may be used to fill the mikvah. As with the rainwater, an intricate set of laws surrounds its transport and handling. The mikvah as an institution is the victim of a popular misconception. Immersion in water is naturally associated with cleansing. To further complicate the issue, Jews historically were often barred by the authorities from using rivers in their cities for bathing. In response they built bathhouses, many with mikvahs in or near them. Together, these factors forged an inextricable link between the idea of mikvah and physical hygiene. But the mikvah never was a monthly substitute for a bath or shower. In fact, the Halachah stipulates that one must be scrupulously clean before immersing. To facilitate this requirement, preparation areas—with baths and showers, shampoos, soaps, and other cleansing and beauty aids—are a staple of the modern mikvah. Until a relatively short time ago, most mikvahs could best be described as utilitarian: function, not comfort, dictated their style. A new awareness among modern Jewish women, the rabbinate and community leaders over the last few decades has sparked a new trend in mikvah construction. Beautiful, even lavish, mikvahs—complete with elegant foyers and waiting rooms, fully equipped preparation areas and well-designed mikvah pools—are being built across this country and around the world. Some mikvahs rival luxurious European spas and offer patrons more amenities than they could enjoy at home. In communities with large populations of mikvah users, the building may house as many as 20 or 30 preparation areas, and two to four immersion pools. In these facilities, an intercom system links each of the rooms to a central desk, and an attendant ensures the privacy of the many mikvah users. Some of the larger mikvah buildings include conference rooms used for tours and educational programming. Today, it is not just a Jewish metropolis that can boast a mikvah. In remote, even exotic, locations—Anchorage, Alaska, and Bogotá, Colombia; Yerres, France, and Ladispoli, Italy; Agadir, Morocco, and Asunción in Paraguay; Lima, Peru, and Cape Town, South Africa; Bangkok, Thailand, and Zarzis, Tunisia; and almost every city in the former Soviet Union—there are kosher and comfortable mikvahs, and rabbis and rebbetzins willing and able to assist any woman in their use. In many communities, a tour of the mikvah is available on request. Upon arrival in a new city or when traveling, information about mikvahs in the region can be obtained by phoning the local mikvah office, the Orthodox synagogue or the Chabad House. In the desert, the famed “well of Miriam” served as a mikvah. And Aaron and his sons’ induction into the priesthood was marked by immersion in the mikvah. The primary uses of mikvah today are delineated in Jewish law and date back to the dawn of Jewish history. They cover many elements of Jewish life. Mikvah is an integral part of conversion to Judaism. It is used, though less widely known, for the immersion of new pots, dishes and utensils before they are utilized by a Jew. The mikvah concept is also the focal point of the taharah, the purification rite of a Jew before the person is laid to rest and the soul ascends on high. The manual pouring of water in a highly specific manner over the entire body of the deceased serves this purpose. For the menstruant woman, immersion in a mikvah is part of a larger framework best known as Taharat Hamishpachah (Family Purity). As with every area of Jewish practice, Family Purity involves a set of detailed laws; namely, the “when” “what” and “how” of observance. Studying with a woman who is experienced in this field is the time-honored way of gaining familiarity and comfort with the practice. In cities or communities with large Jewish populations, there may be classes one can join. The majority of women, however, come by this knowledge through a more personal one-on-one encounter. While books are a poor substitute for a knowledgeable teacher, select titles can be used as a guide to this ritual or for quick reference (see suggested book list in appendix to this essay). What follows is only a brief overview of these laws. It is not, and was not intended to be, a substitute for proper study of this subject. Family purity is a system predicated on the woman’s monthly cycle. From the onset of menstruation and for seven days after its end, until the woman immerses in the mikvah, husband and wife may not engage in sexual relations. To avoid violation of this law, the couple should curtail their indulgence in actions they find arousing, putting a check on direct physical contact and refraining from physical manifestations of affection. The technical term for a woman in this state is niddah (literal meaning: “to be separated”). Exactly a week from when the woman has established the cessation of her flow, she visits the mikvah. Immersion takes place after nightfall of the seventh day and is preceded by a requisite cleansing. The immersion is valid only when the waters of the mikvah envelop each and every part of the body and, indeed, each hair. To this end, the woman bathes, shampoos, combs her hair and removes from her body anything that might impede her total immersion. Immersion in the mikvah is the culmination of the Taharat Hamishpachah discipline. It is a special moment for the woman who has adhered to the many nuances of the mitzvah and has anticipated this night. Sometimes, however, the woman may be feeling rushed or anxious for reasons related or unrelated to this rite. At this point, she should relax, spend a few moments contemplating the importance of the immersion, and in an unhurried fashion, lower herself into the waters. After immersing once, while standing in the waters of the mikvah, the woman recites the blessing for ritual purification and then, in accordance with widespread custom, immerses twice more. Many women use this auspicious time for personal prayer and communication with G‑d. After immersion, woman and husband may resume marital relations. Most Jews, even those who deem themselves secular, are familiar, at least conceptually, with religious observances such as the Sabbath, the dietary laws, Yom Kippur and a number of other Torah laws. Mikvah and Family Purity, on the other hand, are shrouded in obscurity—pages torn out of the book, as it were. Most Jews see the synagogue as the central institution in Jewish life, But Jewish law states that constructing a mikvah takes precedence even over building a house of worship. Both a synagogue and a Torah scroll, Judaism’s most venerated treasure, may be sold to raise funds for the building of a mikvah. In fact, in the eyes of Jewish law, a group of Jewish families living together do not attain the status of a community if they do not have a communal mikvah. In fact, the literal definition of the Hebrew word kodesh—most often translated as “holy”—is that which is separated; segregated from the rest for a unique purpose, for consecration. 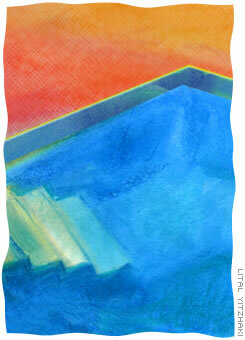 In many ways, mikvah is the threshold separating the unholy from the holy, but it is even more. Simply put, immersion in a mikvah signals a change in status—more correctly, an elevation in status. Its unparalleled function lies in its power of transformation, its ability to effect metamorphosis. Mishpatim are those laws governing the civil and moral fabric of life; they are logical, readily understood and widely appreciated as pivotal to the foundation and maintenance of a healthy society. Examples are the proscription against murder, theft and adultery. Eidut are those rituals and rites best described as testimonials. This category includes the many religious acts that remind Jews of historic moments in their history and serve as testament to cardinal beliefs of the Jewish faith, such as the observance of the Sabbath, the celebration of Passover and the affixing of a mezuzah on the doorpost. The third category, chukkim, are supra-rational principles; they are Divine decrees about which the human mind can form no judgment. Chukkim completely defy human intellect and understanding. From time immemorial they have been a source of amusement, a target of scorn, and an uncomfortable and shameful presence to the detractors of Jewish observance. For the observant Jew, they personify a mitzvah at its best; a pure, unadulterated avenue of connection with G‑d. These mitzvot are recognized as the greatest, the ones capable of affecting the soul on the deepest level. Unimpeded by the limitations of the human mind, these statutes are practiced for one reason only: the fulfillment of G‑d’s word. Examples are the laws of kashrut; the prohibition against wearing shatnez (clothes containing a combination of wool and linen); and the laws of ritual purity and mikvah. When all is said and done, an understanding of the ultimate reason for the framework of Family Purity and its culminating point—immersion in the mikvah—is impossible. We observe simply because G‑d so ordained it. Still there are insights that can help add dimension and meaning to our mikvah experience. In the beginning, there was only water. A miraculous compound, it is the primary source and vivifying factor of all sustenance and, by extension, all life as we know it. But Judaism teaches it is more. For these very same attributes—water as source and sustaining energy—are mirrored in the spiritual. Water has the power to purify: to restore and replenish life to our essential, spiritual selves. The mikvah personifies both the womb and the grave; the portals to life and afterlife. In both, the person is stripped of all power and prowess. In both, there is a mode of total reliance, complete abdication of control. Immersion in the mikvah can be understood as a symbolic act of self-abnegation, the conscious suspension of the self as an autonomous force. In so doing, the immersing Jew signals a desire to achieve oneness with the source of all life, to return to a primeval unity with G‑d. Immersion indicates the abandonment of one form of existence to embrace one infinitely higher. In keeping with this theme, immersion in the mikvah is described not only in terms of purification, revitalization and rejuvenation, but also, and perhaps primarily, as rebirth. In years gone by, menstruating women were a grave source of consternation and fear. At best they were avoided, at worst they were shunned and cast aside. Often, menstruating women were blamed for tragedy and mishap, as if they had polluted the environment with their breath or gaze. This was a simplistic, if not misguided, response to a complex phenomenon whose rhyme and reason eluded the primitive mind. In those societies, peace could be made with menstruation only by ascribing it to evil and demonic spirits, and by the adaptation of a social structure that facilitated its avoidance. Judaism teaches that the source of all taharah, “purity,” is life itself. Conversely, death is the harbinger of tumah, “impurity.” All types of ritual impurity, and the Torah describes many, are rooted in the absence of life or some measure—even a whisper—of death. When stripped to its essence, a woman’s menses signals the death of potential life. Each month a woman’s body prepares for the possibility of conception. The uterine lining is built up—rich and replete, ready to serve as a cradle for life—in anticipation of a fertilized ovum. Menstruation is the shedding of the lining, the end of this possibility. The presence of potential life within fills a woman’s body with holiness and purity. With the departure of this potential, impurity sets in, conferring upon the woman a state of impurity or, more specifically, niddut. Impurity is neither evil nor dangerous and it is not The concept of purity and impurity as mandated by the Torah and applied within Jewish life is unique; it has no parallel or equivalent in this postmodern age something tangible. Impurity is a spiritual state of being, the absence of purity, much as darkness is the absence of light. Only immersion in the mikvah, following the requisite preparation, has the power to change the status of the woman. In ancient times, however, tumah and taharah were central and determining factors. The status of a Jew, whether he or she was ritually pure or impure, was at the very core of Jewish living; it dictated and regulated a person’s involvement in all areas of ritual. Most notably, tumah made entrance into the Holy Temple impossible and thus sacrificial offering inaccessible. There were numerous types of impurities that affected Jews, regarding both their life and Temple service, and a commensurate number of purification processes. Mikvah immersion was the culmination of the purification rite in every case. Even for the ritually pure, ascending to a higher level of spiritual involvement or holiness necessitated immersion in a mikvah. As such, the institution of mikvah took center stage in Jewish life. In our day, in this post-Temple period, the power and interplay of ritual status has all but vanished, relegating this dynamic to obscurity. There is, however, one arena in which purity and impurity continue to be pivotal. In this connection only is there a biblical mandate for mikvah immersion—and that is regarding human sexuality. To understand why this is so, we must first understand how the Torah views sexuality. The alleged incompatibility of sexuality and spirituality—more precisely, their antithetical nature—is a notion that, while foreign to Torah thought, is attributed by many to Judaic philosophy under the larger and completely mythical rubric of a “Judeo-Christian” creed. Few concepts have done more harm than this widespread misapprehension. In stark contrast to Christian dogma—where marriage is seen as a concession to the weakness of the flesh, and celibacy is extolled as a virtue—the Torah accords matrimony an exalted and holy position. Human sexuality is a primary force in the lives of a married couple; it is the unique language and expression of the love they share. A strong relationship between husband and wife is not only the backbone of their own family unit, but is integral to the world at large. For the blessings of trust, stability, continuity, and ultimately, community, all flow from the commitment they have to each other and to a joint future. In reaffirming their commitment, in their intimacy, the couple adds to the vibrancy and health of their society, of humanity, and ultimately, to the fruition of the Divine plan: a world perfected by man. In their private, personal togetherness, they are creators of peace, harmony and healing—on a micro-cosmic scale, but with macrocosmic reverberations—and as such, are engaged in the most sacred of pursuits. In this light, it becomes clear why marital relations are often referred to as the Holy Temple of human endeavor. And entrance to the Holy always was, and continues to be, contingent on ritual purity. The laws of Family Purity are a Divine ordinance. There is no better, more legitimate, more logical or essential reason for their observance. It is a difficult commandment, a discipline that makes demands on our time, our psyche and our emotions. It is a force at odds with the flesh, a way of life that the average person would not likely choose or devise. It calls for willful suspension of self-determination, the subservience of our most intimate desires to the bidding of a higher authority. And therein lies the mitzvah’s potency. The knowledge that it is sourced in something larger than the self—that it is not based on the emotions or subjective decision of one or the other—allows Taharat Hamishpachah to work for the mutual benefit of woman and husband. Ironically, this “unfathomable” mitzvah reveals its blessings to us more than almost any other, in daily, palpable ways. Its rewards are commensurate with the challenge of observance. At first glance, the mikvah system speaks of limitations and constraints—a loss of freedom. In truth, emancipation is born of restriction. Secure, confident, well-adjusted children (and adults) are disciplined children; they understand restraint and learn self-control. Safe, stable countries are those pieces of land surrounded by definite, well-guarded borders. The drawing of parameters creates terra firma amid chaos and confusion, and allows for traversing of the plain we call “life” in a progressive and productive manner. And in no area of life is this more necessary than in our most intimate relationships. “From every tree of the garden you may indeed eat but from the Tree of Knowledge of Good and Evil you must not eat. ... ” So G‑d commanded Adam and Eve on the day of their creation. But they indulged on that fateful Friday afternoon, and the history of mankind was altered forever. The complicated nature of human sexuality has its genesis in this tale. For the Tree of Knowledge contained a mixture of good and bad, and indulgence of this “knowledge” by primeval man introduced a new world order: a world where good and bad intermingled, a world of confusion and challenge, multiple choices and endless potential. No longer would intimate relations—one among many human biological functions—be as natural and uncomplicated as the others. Banishment from the Garden of Eden meant the introduction of a new sexuality: one pregnant. with possibility and fraught with tension. It would hold the key to great ecstasy and excruciating pain, the most tantalizing fulfillment and most devastating sensation of void. A meaningful union would necessitate unequivocal commitment and constant nurturing by man and woman. But even the maximum effort put forth by man would need to be augmented by help from above. The blessing would flow from a reservoir called mikvah, and Eden as it was before the sin would be attainable. Trite as it may sound, mikvah offers couples the possibility of repeated “honeymoons” during the course of their marriage. Boredom, a seemingly innocuous state of affairs, can beleaguer any relationship and chip away at its foundation. The mandatory monthly separation fosters feelings of longing and desire—at the very least, a sense of appreciation—which is followed by the excitement of reunion. Human beings share a nearly universal intuitive tendency for the forbidden. Solomon, the wisest of all men, spoke of “stolen waters which are sweeter.” How many otherwise intelligent, calculated individuals have jeopardized their marriages and families in pursuit of the illicit because of its seeming promise of the romantic and the new? Mikvah introduces a novel scenario: one’s spouse—one’s partner in life, day after day, for better and for worse—becomes temporarily inaccessible, forbidden, off-limits. Often, this gives couples reason and opportunity to consider each other anew. In this “removed” span of time, from this new vantage point, they view and approach each other with enhanced appreciation. The Taharat Hamishpachah discipline is helpful in other ways as well: fluctuation and disparity in sexual desire can never be completely alleviated. Yet the regulation in the mikvah system serves to assuage tensions that arise from this source. For couples who must abstain for a minimum of 12 days a month, the time they have together is peak time for both, a time they cherish and savor. The benefits brought to married life by the practice of Family Purity have been recognized by numerous experts, Jew and non-Jew alike. To be sure, this type of analysis, as any other, is subject to argument and critique. Ultimately, however, mikvah’s powerful hold on the Jewish people—its promise of hope and redemption—is rooted in the Torah and flows from a belief in G‑d and His perfect wisdom. Judaism calls for the consecration of human sexuality. It is not enough that intimacy be born of commitment and sworn to exclusivity; it must be sacred. As such, the first mandated time for immersion in the mikvah is at the threshold of marriage. Mikvah before marriage, strictly speaking, is not contingent upon a commitment to regular observance of Family Purity. Even so, it should not be understood as unrelated to this larger framework. It is simply the first time a Jewish woman is commanded to purify herself in this way. And it is an awesome and auspicious way to start a new life together with one’s beloved. After learning of the details and giving them due consideration, mikvah is a ritual that can be easily incorporated in the pre-wedding preparations by every Jewish bride and groom. The wedding date should be planned around the bride’s monthly cycle, thus allowing for her immersion before the nuptial. Tremendous amounts of time and energy are expended in planning a wedding. There is an innate human hope that a perfect wedding equals a perfect start in life. Yet all thinking individuals recognize human limitations. That which we most need and want—health, good fortune and children—are beyond our control. As we voice the age-old greeting of mazel tov, we are offering up a prayer to the One above, asking that He bless the new couple with abundant goodness. Immersion in the mikvah is an important way of drawing G‑d and His blessing into the marriage. For as long as a woman menstruates, her monthly cycle dictates the rhythm of conjugal relations within the marriage, and each month, it is a mitzvah for husband and wife to draw renewal from the waters of the mikvah. For those who have not made a lifelong commitment at the onset of married life, it is never too late to begin following the laws of Family Purity. Similarly, while observance should ideally be continuous, one should not allow a lapse of any length to deter further commitment. Nor is this practice contingent on the observance of other precepts in the Torah. Mikvah is not, as is often thought, the exclusive domain of the strictly observant. For the postmenopausal woman, one final immersion in the mikvah offers purity for the rest of her life. Even a woman who has never used the mikvah before should make a special effort to immerse after menopause (it is never too late for a woman to do this, even if many years have elapsed since her menopause), thus allowing for all subsequent intimacies to be Divinely blessed. The single greatest gift granted by G‑d to humankind is teshuvah—the possibility of return-to start anew and wash away the past. Teshuvah allows man to rise above the limitations imposed by time and makes it possible to affect our life retroactively. A single immersion in the mikvah late in life may appear insignificant to some, a quick and puny act. Yet coupled with dedication and awe, it is a monumental feat; it brings purity and its regenerative power not only to the present and future, but even to one’s past. In this way, each woman can link herself to an ongoing tradition that has spanned the generations. Through mikvah she brings herself in immediate contact with the source of life, purity and holiness—with the G‑d who surrounds her and is within her always. Bulka, Reuven P. Jewish Marriage: A Halakhic Ethic. Hoboken, N.J.: Ktav Publishing House, 1986. Friedman, Manis. Doesn’t Anyone Blush Anymore: Reclaiming Intimacy, Modesty and Sexuality. San Francisco: Harper San Francisco, 1990. Kaufman, Michael. Love, Marriage, and Family in Jewish Law and Tradition. Northvale, N.J.: Jason Aronson, 1992. Lamm, Maurice. The Jewish Way in Love and Marriage. Middle Village, N.Y.; Jonathan David Publishers, 1980. Lamm, Norman. A Hedge of Roses: Jewish Insights into Marriage and Married Life. New York: Philipp Feldheim, 1966. Tendler, Moshe David. Pardes Rimonim: A Marriage Manual for the Jewish Family. Hoboken, N.J.: Ktav Publishing House, 1988. Slonim, Rivkah. Total Immersion: A Mikvah Anthology. Northvale, N.J.: Jason Aronson, 1996. G=d sees I begged my first husband for biblical family purity, and his response was a vasectomy and divorce. As a young mother of three, and devoted to Hashem, I was devestated, dismayed. But G=d saw me there. Within a year, in a mikvah for complete conversion, and praying at the western wall. G+d sees!! !Ten years later, immersed in Torah, Hebrew. I am remarried. My grown children come to my home to enjoy Shabbat. I look forward to Grandchildren and a new age of Meshiach. Dont think you may not suffer for righteousness sake, but Hashem is close to me, a Treasure in earthen vessel, rising above the pain and vanity of impurity to realms of holiness and joy. I just groan for my Ex. Tragic. He is again, an alcoholic. He never drank during our marriage. His poor choices are very hard on his children, but they do have a bright light to follow through their mother. I mikvah in a natural body. I did so yesterday, Nov. 7th. Invigorating! 83 comments and counting, you don't need mine but the article demands it! i could detail comparative practises in Torah study realities wherein are the holy nature (as in the G-dly intelligence arranging and planning the use by humans of words and meanings in a physical world) and Its interplay in the life of humans thru the giving of Torah in the first place. your 'long' piece was like a giving of a superior and lofty understanding of ritualistic down-to-earthiness in such a wonderfully organized way that the light became brighter than the sun! This is beautiful and motivating -- except the part where you suggest there is a time when a woman does not have full control over access to her body. Here: "There is, additionally, an empowering feeling of autonomy over their bodies and, indeed, over the sexual relationship they share with their spouses. There is strength and comfort in the knowledge that human beings can neither have their every whim nor be had at whim." Everyone in community has to help build one. No excuses. I had the honor to physically build one on Long Island. It took 7 years. Very challenging. Labor intensive. I do not regret one shlep or penny spent on building it. One of three in Suffolk.Now it is out to good use . To Anon in SC The fact is Yashka was not a rabbi. He was not ordained. Being ordained means a man has learned, and passed tests, on certain areas of Jewish Law. Going to the mikvah means a person is making sure he or she has no impurity. You can be entirely unlettered, illiterate even, and still go to the mikvah. You can also have the deepest level of impurity, and still be a rabbi. Being a rabbi also has nothing to do with being a Kohain. Kohanim were priests, any one kohain would know how to do his job, but that may be all he knew. So, Yashka went to the mikvah and Yochanan was his shomer. Yochanan made sure he dunked completely, with no hair floating, etc. This doesn't say anything about the scholarship of either man.